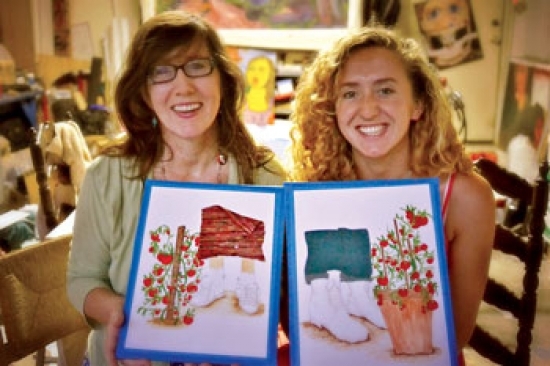 Kerry Madden, M.F.A, UAB assistant professor of creative writing, took on the charge of writing about famed Southern storyteller Kathryn Tucker Windham and renowned Alabama folk artist Charlie Lucas's friendship, collaborating with her artist daughter Lucy Madden-Lunsford to create a children’s tale. Never underestimate the power of a tomato sandwich. For the late, famed Southern storyteller Kathryn Tucker Windham and renowned Alabama folk artist Charlie Lucas, that was the meal that set in motion a years-long treasured friendship, one that is a shining example of love, acceptance, and kindness. The tale of the duo’s famed tomato tryst—as well as anecdotes of them hunting for stories, metal scraps, and Christmas trees; fishing along sandy riverbanks; and performing hair-comb kazoo concerts—will be told to children of all ages for decades to come thanks to Kerry Madden, M.F.A, UAB assistant professor of creative writing. Madden, a lauded storyteller herself, took on the charge of writing about Windham and Lucas’s friendship, collaborating with her artist daughter Lucy Madden-Lunsford to create the children’s tale. apples in the Alabama sunshine. They loved to go fishing. Windham, who died last year at 93, was a world-famous writer and master storyteller who penned nearly 30 books about everything from grits to ghosts. She captivated audiences with her colorful stories of life as a Southerner; many aired weekly on National Public Radio. Lucas, a former maintenance man, prayed to God to give him a talent like no one else’s. Those prayers were answered. He spends his days searching the earth for old, discarded junk like busted car mufflers, railroad spikes, and metal scraps and then fashions them into magnificent statues and works of art that are sought by art lovers around the world. Although Windham and Lucas could have lived in big, fancy houses and gone about town touting their accomplishments, they chose to live humbly in a quiet Selma neighborhood in homes that sit side by side. At first glance, the two appeared mismatched: a petite white woman more than 30 years the senior of a tall, lanky black man. But their endearing simplicity and love for art and all things Southern made them twin souls. Plus, Windham loved libraries, Madden says. The tour is a tribute to her. “She knew the library was the greatest place in Selma for children to go and learn to read and write and tell stories,” Madden says. In fact, all the proceeds from the book sales will go to the Selma-Dallas County Public Library, Windham’s favorite place. Madden had not planned to write a book about Windham and Lucas. It kind of just happened, she says. After assigning her children’s writing workshop students the task of writing a ‘friendship’ story, she decided to write a friendship story, too. “I remembered how Charlie had made Kathryn a tomato sandwich, and I thought of the day I’d spent with them the previous spring, and I just started writing,” she says. As the story goes, Windham and Lucas, although both Alabama residents and seemingly cut from the same Southern cloth, had spent years on the cultural scene but had never met. It was in France, of all places, that the two crossed paths. They sat among artists and admirers at a fancy dinner when Windham mused that she would love to have a tomato sandwich. Lucas’s ears perked up. He’s a tomato sandwich kind of guy, too. He quickly got his hands on some tomatoes and bread, and together the two savored the sandwiches while also satisfying their appetites for down-home companionship. Charlie told Kathryn about collecting junk. Kathryn told Charlie about catching stories. Then they were quiet, gazing at the plum sky of sparkling stars over France. Madden teaches aspiring writers at UAB and often shares the lessons she learned from Windham and Lucas with them. But even with her own literary accomplishments, she was initially nervous about meeting a literary legend, she says. But Madden’s fears were unfounded. When she went to Windham’s home, she was welcomed like an old friend. “I’ve been expecting you,” Windham told her, and she had the cornbread and sweet tea ready. “I felt like I had known her all my life,” Madden says. Later she introduced Madden to Lucas. “Their backyards were connected, and Lucas’s Trojan horse sculpture kissed Windham’s garden of tomatoes and sunflowers. 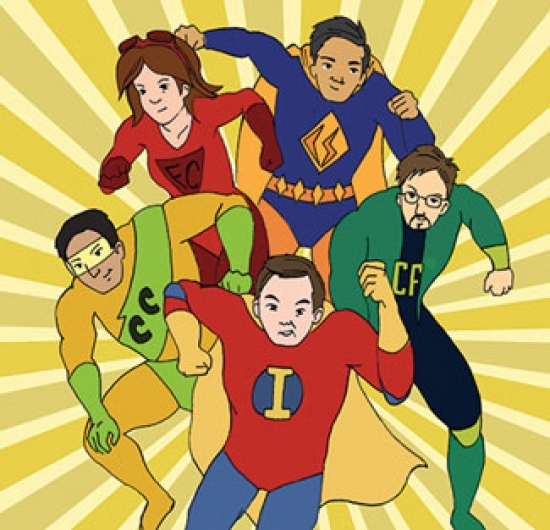 They may not wear spandex or leather boots, but the elite team of investigators at the College of Arts and Sciences’ Center for Information Assurance/Joint Forensics Research (CIA/JFR) do indeed have some unique superpowers. They may not wear spandex or leather boots, but the elite team of investigators at the College of Arts and Sciences’ Center for Information Assurance/Joint Forensics Research (CIA/JFR) do indeed have some unique superpowers. John Grimes, J.D., a career U.S. Army veteran who only recently returned to the UAB faculty from Afghanistan where he helped coordinate U.S. intelligence, is now using his knowledge of intelligence analytics to hunt down nefarious groups attacking U.S. businesses and government agencies. He’s not the kind of man you want to cross. On the wall of his office are certificates from sniper school, paratrooper school, and a host of other elite military training recognitions and awards. 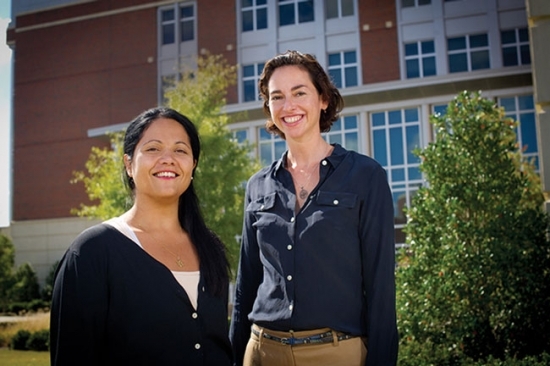 One floor above in UAB’s University Boulevard Office Building is the office of forensic scientist Elizabeth Gardner, Ph.D., an expert on the chemistry of illegal drugs who once helped analyze the failure of deep space rockets for NASA. Students in Gardner’s labs have learned to detect microscopic traces of cocaine residue on dollar bills and sort out the dangerous chemical mixtures found in drugs sold over the Internet. In the SPIES (Security and Privacy in Emerging Systems) lab just across the road, the computer scientist Nitesh Saxena, Ph.D., is devising transformative ways to help users stay secure online, including turning password-based logins into a game as well as protecting new ways of making sensitive transactions, such as near field communication-based payments. Meanwhile, computer forensics expert Gary Warner is using the UAB Spam Data Mine to track the criminal gangs responsible for stealing millions of dollars in cyberspace. CIA/JFR, known as “the Center,” is directed by Tony Skjellum, Ph.D., chair of the UAB Department of Computer and Information Sciences. It now includes dozens of investigators from a range of specialties with a common goal—to stay at the cutting edge of crimefighting and share the fruits of their research with law enforcement, affected businesses, and consumers. “Our members work together to help create, prototype, test, implement, and refine tools to strengthen all defenses against any potential attacks,” Skjellum says. Research Focus: Identifying emerging drugs of abuse; testing illicit drugs to determine the identity and concentration of common adulterants; testing clothing from clandestine labs for methamphetamine and other drugs; infrared spectroscopy of blood; laser analysis of trace evidence. 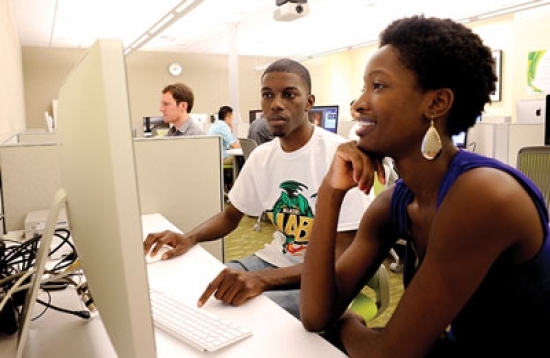 The College of Arts and Sciences (CAS) is at the forefront of helping students and other members of the UAB community get ahead of the information curve through creation of the Digital Media Commons—a hands-on, open resource advance the university’s plugged-in faculty, staff, and students. Today's digital revolution is like the 1990s Information Highway on steroids. More than 1.5 billion people are now connected to the Internet via computers, not to mention more than 5 billion feature phones, 500 million smartphones, and 60 million tablets and e-readers globally—and those numbers climb daily. These staggering data give new meaning to the term “digital literacy.” Fortunately, the College of Arts and Sciences (CAS) is at the forefront of helping students and other members of the UAB community get ahead of the information curve through creation of the Digital Media Commons—a hands-on, open resource advance the university’s plugged-in faculty, staff, and students. “Digital and media skills are as important as writing ability in today’s wired world, which is ultimately why the lab and classroom were created,” says Rosie O’Beirne, director of digital media and learning, a new CAS entity that includes the Digital Media Commons and a variety of digital initiatives that benefit faculty and students. Thanks to support from CAS benefactors, full digital editing options are available at the DMC. Faculty, staff, and students can edit videos using Final Cut Pro, Adobe Premiere 6, and Avid Media Composer—all industry standards in documentary filmmaking and Hollywood studio productions. Selling a product is one thing—but how do you market a region in need of revival? If you're a graphic designer, like UAB assistant professor Doug Barrett, M.F.A., you approach it like any other commodity: Talk to the client, develop a true understanding of the product, and perhaps most important, find the story that will sell it. 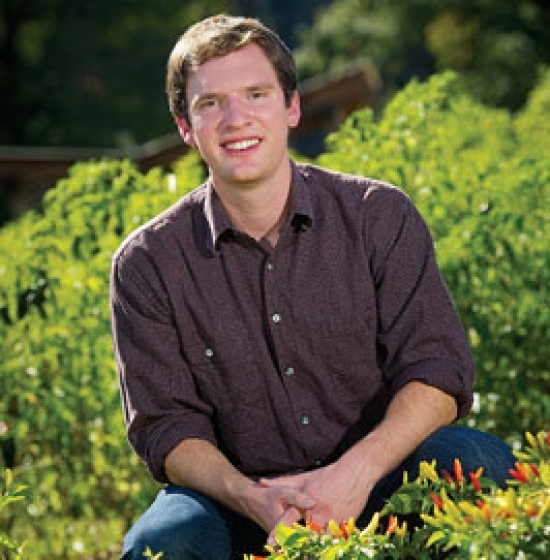 That's what Barrett did as a graduate student at the University of Florida, when he worked with Mayan villagers in Mexico to help them develop a sustainable economy around local honey and orange juice. And that's what he's now teaching his students to do for Bibb County, Alabama—tour the area, meet the people, and discover the unique qualities that can help revive an economically struggling county—with the help of well-designed brochures, signage, and marketing collateral. AIGA, the professional organization for graphic designers in the U.S., calls it "Design for Good." Barrett calls it an independent study class, which is by invitation only. Through this class, students come together to work in a student-run design studio called Bloom Studio, where they take the design process beyond the standard in-class curriculum, using what Barrett calls the "graphic design toolset" to solve social problems and benefit their community. The final result will be a tangible product for the client to put to use and the students to add to their portfolios. The goal of their current project is to promote tourism in Bibb County—an effort that has involved weeks of research, numerous visits and interviews, and lots of questions. "Who is their audience? Who is their competition? And what does Bibb County have that we can leverage into something interesting people might want to come see?" Barrett says, characterizing Bibb County's assets and attractions as "the story behind the brand. What is the story, and how do we get the story out there?" The class's project last fall was to create marketing material for the Cahaba River Society (CRS). Barrett's students designed a collection of three brochures—graduated in size and designed to nest artistically—promoting the river, including basic river excursions, canoeing safety, the Children Linking with the Environment Across the Nation (CLEAN) Program for children, and of course membership in the nonprofit CRS. They also designed a license plate benefiting the society that will be available for purchase next year. This work resulted in the award of a Sappi Ideas That Matter grant of $47,000 to create a book to tell the story of the CRS. The students' work with the CRS led them to the Friends of the Cahaba, for whom they developed a Web site. One of those friends was Matthew Hartzell, Bibb County extension coordinator, who had an idea for the students' next client. Barrett and his students worked in conjunction with the Alabama Innovation Engine (AL Engine), which is a collaboration between Auburn University and The University of Alabama that supports the AIGA's Design for Good initiative. "Our contact at Alabama Engine is Matt Leavell, who has done a ton of work finding those in need and those with the skills to help," Barrett says. In touring Bibb County, talking with locals, and exploring local attractions, the UAB group discovered that the county's main draw dovetailed nicely with another project supported by the AL Engine: the development of a Cahaba Blueway, a watery trail with points of interest for canoers and kayakers that flows right through the center of Bibb County. But the tourist attractions in Bibb County extend beyond riparian pursuits. Barrett and his students visited the Brierfield Ironworks, the West Blocton coke ovens, the Cahaba National Wildlife Refuge, and other dry-land destinations that could make up a full day's visit—if visitors know where to go. "Sometimes people think, 'Just highlight everything in Bibb County,' but that's kind of tough," Barrett says. "If you're just driving in, it's difficult to enjoy everything they have, and there isn't a lot of infrastructure." The solution? A collection of day trips to promote to tourists, based on attractions already available in the county, with signage and maps to direct visitors around the area. 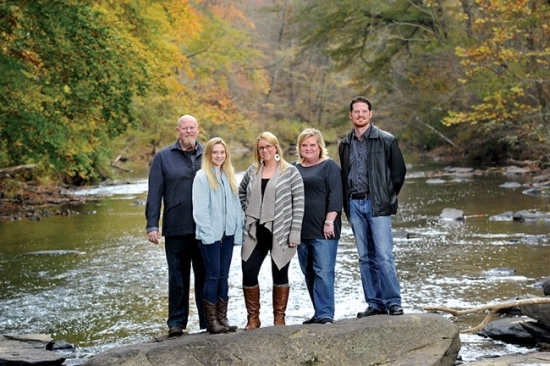 Some of the most curious new tourists, Barrett says, were the students themselves, many of whom have lived in Jefferson County all their lives without visiting the Cahaba River or Bibb County. "It's an eye-opening experience and very worthwhile," he says. "The important thing is not just coming from the outside and trying to effect change, but also getting local people interested in effecting the change." The students who choose to participate in this course come preloaded with an interest in the world around them. "They're interested in preserving natural beauty and preserving culture, whether that's outside the United States or in a small town in Bibb County," Barrett says. "They recognize the significance of culture, history, and community, and how important it is to preserve those things." For those students, the end product is a better understanding of and appreciation for their community, a chance to use their developing skills in a real-world application, and a portfolio of completed work to take out into the world after graduation. "The students get really thrilled by it," Barrett says. "The power of this is that they're not just doing work in a class, in a vacuum. They actually get to meet the client, work with the client, and do real projects that end up getting produced. It's a real professional experience." The Cahaba River has been recognized nationally and internationally for its biodiversity and has been named one of the 19 and 52 most important places to preserve in the next decade by the World Wildlife Fund and the Sierra Club, respectively. Barrett's students are working with the coordinators of the Cahaba Blueway Project and others to develop interest around the river and highlight resources that can help sustain the local economy. "It's interesting to think that we're trying to brand a river, with a logo and type palette and color palette—and that goes into things like signage along the take-outs and put-ins of the river, and T-shirts, and books and maps and wayfinding applications," Barrett says. Sharyn Jones, Ph.D., associate professor of anthropology, recently returned from a three-week sojourn to India with 11 UAB students; the trip was the first study-away opportunity offered as part of the UAB College of Arts and Sciences' new minor: Peace, Justice, and Ecology (PJE). "People are sick, people are in poverty, it's 120 degrees in Delhi—and this is where you study peace?" Sharyn Jones, Ph.D., associate professor of anthropology, offers this rhetorical question with a lilt of laughter. 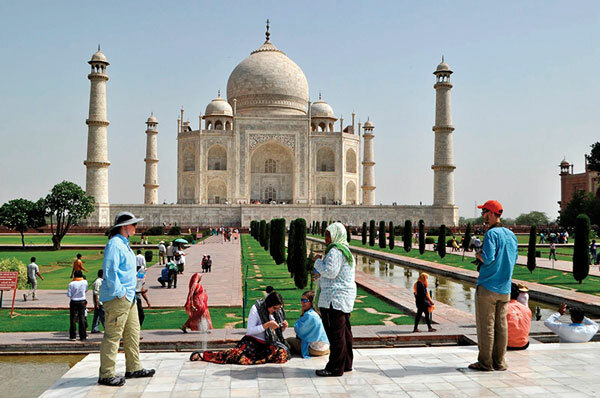 Jones recently returned from a three-week sojourn to India with 11 UAB students; the trip was the first study-away opportunity offered as part of the UAB College of Arts and Sciences' new minor: Peace, Justice, and Ecology (PJE). "You are educated in an entirely different way when you are immersed in the sights and smells of a place, where the language is different and the customs are different," Jones says. "Trips like this allow students to spend time with people in other cultures and to actually engage them." The study-away course, the Culture of Peace in India, included major sightseeing stops—the Taj Mahal in Agra, the Qutb Minar, and the Bahá'í Lotus Temple in Delhi—but the Active Nonviolence Education Center (ANEC) in Dharamsala was perhaps the most important site on the itinerary. During almost three weeks of daily workshops, the students learned from and worked with Tibetan refugees who offered instruction in nonviolent conflict resolution. They learned about the lives of Mohandas Gandhi and Martin Luther King Jr. They learned how the concept of peace is perceived in a variety of different cultures. Since the PJE program focuses on real-world strategies for social justice and environmental sustainability, the chaos and tumult of India provided a vibrant—almost overwhelming—context for students to consider these inspiring concepts. "Issues of peace, conflict, and social justice have always been a part of the study of anthropology," Jones says. "But our students constantly encounter problems in the real world without knowing how to fix them. One of the goals of this minor is to show students ways to change the world on a small level but ultimately to make a large impact." As a CAS interdisciplinary program, the PJE minor evolved from what was the environmental studies minor. The new program is the brainchild of Jones and Lori Cormier, Ph.D., program director for the master's degree in anthropology. It gives students the opportunity to examine themes of ecological adaptation and sustainability as well as investigate environmental health and human rights in local, cross-cultural, and global contexts, and then use scientific, philosophical, and ethical reasoning in developing solutions to problems. The point is to provide students with a broad learning experience in human-ecological interactions and biocultural diversity. Put another way, the minor offers deep digging in what it means to be human. The PJE minor has attracted students majoring in biology, chemistry, and international studies as well as students with individually designed majors. For Genevieve Begue, a senior pursuing a double major in international studies and conflict resolution and the Middle East, the travel opportunities afforded through the PJE minor make for particularly potent learning experiences. Begue, who wants to work as a "peace builder" in the Middle East, traveled to Israel during her sophomore year at UAB, but she says even that life-changing trip didn't fully brace her for India. "I left Birmingham with few expectations and a bunch of fears," Begue says. "I purposely tried to avoid getting much information on India and on Dharamsala. I wanted this trip to be a culture shock as much as possible, although I couldn't help talking about it as we got closer to departing and my excitement grew. I packed every kind of wipe and hand sanitizer and had planned to cover myself from head to toe. I must admit I was a little scared. "Despite leaving with few expectations," she says, "India kept catching me by surprise. I had been warned that no matter how much I tried to prepare myself, India would just blow my mind. Indeed, it did!" Begue often felt numerous contradictory emotions all at once. "I experienced a rollercoaster of emotions: fear, love, hate, apprehension, amazement, irritation, compassion, gratefulness (a lot of gratefulness), sadness, joy, disgust, and fascination," she says. "The best part of India is that even when something is disappointing, you probably can find the very opposite as well." Begue's travels have convinced her that study-away trips should be a part of every student's college experience. "I learned so much about the cultures of the countries I visited, and learned from and with the people I met," Begue says. "I simply came back a different person. Immersed in other cultures, I was able to understand firsthand some of the political issues I had studied in class." According to Jones, the students were challenged not only to absorb and confront concepts of peace in the endless upheaval of India, but also to strategize on how they might bring that peace home. "How you make the world a more peaceful place was a major focus of the trip," Jones says. Daily interactions with Tibetans taught Begue that peacefulness through nonviolence is a way of life. "I learned one Tibetan expression, 'Tashi Delek! '—a greeting for which the translation may vary from 'May everything be well!' to 'Auspicious greetings.' The expression is a key that opens a smile-box, bringing full, bright smiles to their faces, which stay long after you pass by." Begue explains. "Tibetans cherish and celebrate life in every form, the smallest insect being of great significance for simply being alive," she says. "From Dharamsala, I brought back a sense that peace can only live as we cultivate and nurture it. Peace takes work in every instant—a work of education and tolerance, of love and of patience." Begue's numerous unique personal experiences represent the transformative power of immersion learning. "In our discipline, we aim to observe different cultures from an insider perspective," Jones says. "We often see students very quickly transformed by their new surroundings. "One of them—one of us, any of us!—may be saying, 'I'm different than these people. It's hot. The food tastes different.' But as you get really engaged with people," she says, "the less intense those differences become."